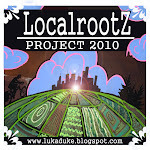 Localrootz Project: 2011 in Review... Omnivores ! 2011 in Review... Omnivores ! exploring all aspects of this process. Whether it is ordering the stranger cuts and bits of the animal to make sure its life was not taken for granted or saving bones and juices to create sauces and stocks for a future meal. We also remain steadfast in knowing and visiting the farms in which our meats are coming from to ensure the proper care is being taken to provide the animals with a high quality of life. Its not only better for the animal but it is reflected in the quality of the end product. In fact I was able to help in the harvesting of 32 turkeys and 6 ducks for the thanksgiving feast this past November at Frith Farm in Scarborough and got to understand and appreciate the reality of this process. Below is my reward for the help and I was happy to receive a very good education from Daniel and Courtney. This duck died in my hands and I spent hours upon hours to see that no part of this bird was wasted. Mmmmm what a feast paired with Argyle Nuthouse Reserve Pinot Noir 2006 and shared with a couple of friends. Another Frith Farm product that made it onto our plates this past winter was this roasted chicken. Stay tuned for more ramblings on wine, beer and some visits to local breweries and farms !